Recently the wireless access-point decided that I should not have access to the management interface. I even tried both the IPv4 address I assigned and the default IPv4 address it gets. And the last days I noticed strange delays, which may have been caused by channel overlaps. So I wanted access to the management interface to check the channel settings. I noticed the management interface decided to respond again on the IPv4 address I assigned, and I saw new firmware available which should also help with some stability issues. Firmware upgraded, and after the upgrade and automatic reboot my access was gone again. Time for the suggested factory reset to get everything back to normal. Done, and I was able to set it up again from scratch with the right configuration. Maybe I should start running some kind of wiki or something to keep internal documentation of my home network. I had a hard time remembering several details of my own setup recently. I was looking at on-line offers of shielded/foiled network cable and found out it's not that expensive anymore. And with the 'keystone' connectors it looks like it's not that complicated to make neat and very well shielded connections. But it's always a good plan to check the local electronics hobby shop. We still have one in the center of Utrecht: radio centrum where they had 1 meter and 2 meter patchcables for a very nice price (competitive with on-line shops) right up for grabs. So the first set of short cables that are always in use for gigabit are now s/ftp category 6 cables. I hope this improves radio reception. I still think I will order longer cable and keystone connectors and holders for the longer cables. Sharing my earlier experiences with the hidden telnet interface on the Netgear GS716T switch was appreciated by someone else with a Netgear GS110p switch: "Hidden" CLI interface on Netgear GS110TP. So I guess this is a feature on multiple netgear switches. * Add IPv6 management, IPv6 ACL, and IPv6 DiffServ support. Ik vroeg me recent af wat het aanbod is in access-points voor thuis met dual-radio support, dus tegelijkertijd actief op 2.4 GHz en 5 GHz. Op de 5 GHz band is minder storing maar niet alle apparaten die wifi gebruiken ondersteunen 5 GHz. En 802.11n op 2.4 GHz doen is volgens mij asociaal omdat je dan helemaal andere netwerken in de buurt stoort. Toevallig blijkt het agentschap telecom het met me eens te zijn: Met een combi-router ben je goed voorbereid op de Wi-Fi van de toekomst - Agentschap Telecom. Dus liefst heb ik een access-point met dual-radio, 802.11n ondersteuning alleen op 5 GHz, WPA2 en niet te veel stroomgebruik. Het lijkt soms dat 2 access-points met verschillende settings wel eens goedkoper in aanschaf kunnen zijn dan eentje met al deze opties, alleen dan vast in stroomgebruik niet. Conrad maakt in z'n laatste mailing reclame voor een Conrad POF thuisnetwerkkabel starterkit. Alleen ik kan nergens terugvinden hoe snel data over plastic optic fiber (POF) kan. Ik dacht uit het verleden dat dit beperkt was tot 100 megabit maar misschien is er een nieuwe standaard die wel tot gigabit gaat. Plastic optic fiber kan een goeie aanpak zijn om in huis langere afstanden te overbruggen zonder terug te vallen op ethernet over stroomnet. In de voordelen van plastic optic fiber noemt Conrad ook Geen afstraling (elektrosmog). Ik zou 'geen radiostoring' een betere omschrijving vinden, maar dit spreekt natuurlijk meer aan. Of the 3 available nameservers, numbers 2 and 3 decided to negatively cache fg.geo.uu.nl for good reasons earlier. Options rotate counts per program which means the impact isn't that big for short-lived programs. I guess telnet does a query before querying the nameserver for the needed address to connect to. The predicted change from KPN to T-Mobile took a bit longer than predicted but it has finally happened. Network speed is now 1 mbit down and 32 kbit up according to speedtest. Somebody I spoke about it wondered whether there was a data subscription included at all or this was the rate at which things could get expensive fast but the T-Mobile business website confirms that this is the slowest data subscription available from T-Mobile NL. I checked for updates of NDPMon, an IPv6 neighbour discovery protocol monitor and noticed I was way behind the current times. I also found out it can now monitor multiple network interfaces in once instance of the program, so I can keep an eye on both wired and wireless networks at home. Do take the advice of using the 'learning' mode of NDPMon as mentioned in the documentation for NDPMon. It makes getting the entire correct router advertisment correct into the datafile correctly so much easier. Downside is you have to run at a quiet time and after each IPv6 network reconfiguration. It would also be nice if NDPMon would report on which interface certain traffic was seen. Under the tag addresses are listed the IPv6 global addresses of the router. This is not required for the tool to work properly, but can be useful is the router send NA messages for its global addresses (to avoid raising NA router flag alerts). So I added the global IPv6 addresses of the routers, let's see if this decreases the noise. I had to test some part of the multicast setup on the work network and fired up VLC. 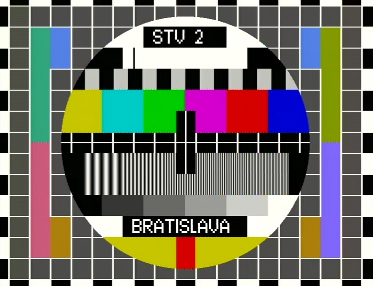 And from the department of 'some things never change' or 'still going strong', Bratislava STV2 testcard is still available under the title 'Monoskop' on vlc url rtp://@233.10.47.73:1234. This stream must have been going for years, I remember using it in tests years ago. And during the day when STV2 has no program, it still transmits an actual Philips PM5544 testcard. Interesting difference of opinion there, 73/112 megabit versus 1.18 megabit. Reception of 2 meter radio doesn't get worse/better during these tests. According to the devolo dlan 200 faq the devices work in the range of 0 to 30 MHz with notches for HF amateur frequencies. With the software defined radio I also see no change in the 2 meter band when running bandwidth tests. Which doesn't say a lot: I can't even find the output from PI3UTR at 145.625 MHz in the output plot, even with a receiver nearby receiving that same signal fine. The output plot does show APRS active on 144.800 MHz. Another thing I puppetized: setting static routes on redhat-like servers. We have two rfc1918 ranges for management network so systems with a public IPv4 address and a management IPv4 address need a static route to the other half of the management network. Time for puppet which distributes the /etc/sysconfig/network-scripts/route-* files and does an ifdown and ifup of the affected interface. Using the variables from facter I can find whether a host is on one of the management IPv4 ranges and on which interface, and create routes accordingly. s0.wp.com is an alias for cs82.wac.edgecastcdn.net. s1.wp.com is an alias for cs82.wac.edgecastcdn.net. s2.wp.com is an alias for cs82.wac.edgecastcdn.net. 0.gravatar.com is an alias for cs91.wac.edgecastcdn.net. Seems edgecast has an IPv6 reachability problem from here (home, xs4all IPv6) but not from other places. I can't reach the edgecast site either since it's on their own network. Or at least I can't via the squid proxy, I can when not using a proxy, since firefox has its own ideas about timeouts. I tried to notify edgecast via e-mail and twitter. Update 2012-11-12: Noted by others: WordPress IPv6 Issues - dereenigne.org seeing something more like PMTU problems. After a few changes and a lot of testing, we believe the IPv6 issue experienced by some users is now resolved. Update 2012-11-15: More traceroutes to test. It seems the only thing unreachable is exactly the /48 which holds the IPv6 content server(s). Update 2012-12-07: A network engineer at xs4all contacted Edgecast and got the problem solved pronto. I guess he has a better entry point! Some updates to the findings on playing with a cablemodem after getting access to a second cablemodem. The interesting conclusion is that the first one still seems to be 'blacklisted' as I can't get an answer to DHCP requests when using that one. IPv4 addresses aren't "finished" at RIPE yet, but allocation is now according to quite strict rules: IPv4 Address Allocation and Assignment Policies for the RIPE NCC Service Region. I run arpwatch on my home networks (wired and wireless are separate with slightly different policies). Since a Samsung Galaxy s3 showed up on the home wifi network things have been interesting. It does speak IPv6 with privacy enhancements. It also makes up a daily 10/8 address which get noted by arpwatch.